Guillermo del Toro’s The Shape of Water is not one of his best films but it is a story that includes many of his themes. Tyranny over nature , inventions and technology that represent the future of man, and mutants that defy these standards. The Shape of Water is a time capsule from the American/Russian Cold War set in a US government laboratory much like the setting of Hellboy (2004) and Hellboy:The Golden Army (2008). The sadistic, predatory, misogynist and racist head of operations at the facility, Richard Strickland (Michael Shannon), has control of a mutant that he captured in South America, resembling The Creature from the Black Lagoon (1954). He is called “Amphibian Man” (Doug Jones) and is not able to speak nor is as benevolent as Abe Sapien in both 'Hellboys' (played also by Doug Jones) and attacks in self-defense. The Russian scientist Dimitri is the only official at the plant looking out for Amphibian man. Later one of the cleaning ladies at the lab takes an interest. Del Toro has written and directed several magical films besides the two 'Hellboys' including Pan Labyrinth (2006) and the bizarre television production The Strain. The largesse of the budget for The Shape of Water went to set design, which consists of a laboratory and an apartment over a movie theater and parts of the town that surround the government complex. Sally Hawkins plays Elisa Esposito, a mute cleaning woman and the victim of an unknown criminal assault that left her scarred. She works together with Zelda Fuller (Octavia Spenser) at the government lab. Elisa lives alone and has an interesting gay neighbor Giles (Richard Jenkins) who is a commercial artist out of regular work. In their adjoining apartments, she looks out for him while Zelda looks out for her. Zelda’s commitment to Elisa is stronger than to her lazy ungrateful husband. 'Amphibian Man' is kept in one of the laboratory tanks and Elisa entices him out with eggs and music. The interiors of the lab are exceptionally created as well as Elisa and Giles’ apartments, a diner with a homophobic and racist owner, and Richard’s home with his dutiful high-heeled hairsprayed wife. All environments are filled with artefacts from the 1960’s – finned Cadillacs, trinkets and bric a brac, and clothing and vintage furniture. Television programs and film excerpts are displayed on TV consoles: a variety of Hollywood musicals, newsreel footage of police brutality against blacks, Henry Koster’s The Story of Ruth, Shirley Temple, Mr Ed - the talking horse and speeches by JFK. At Venice, the film received the Golden Lion for best film, and its visual effects, mise en scène and stunning cinematography have been praised ever since. 'Amphibian Man' is worshipped in the Amazons just as The Creature from the Black Lagoon (1954). Both humanoids are of interest to science and more importantly form an attachment to a woman. In The Shape of Water, the romance accompanied to French love songs eventually consumes the narrative. Elisa is crazy about Amphibian man who does not see her imperfection, whereas the perfect Julie Adams as Kay Lawrence in The Creature from the Black Lagoon was horrified at the prospect of the match. Richard Strickland is antagonistic and cruel towards the creature who is in the care of the military. The employees of the lab are harassed with racist, misogynist and xenophobic comments. Strickland knows how to badger Eliza and her past as a survivor and makes references to 'Samson and Delilah' to humiliate Zelda. 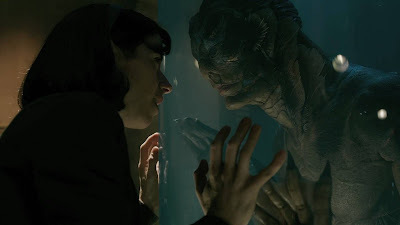 The weakness and strength of The Shape of Water is its narrative evolution through the magic of discovery of this new environment, this time period, and the characters that live during this time. 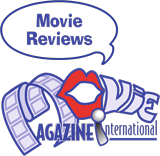 "The Creature"and Elisa and their passion ultimately guide the film towards its end . Romance and dance numbers from Golden age Hollywood movies eclipse the misogyny, homosexuality, racial discrimination , the brutality of the military industrial complex, the space race, class differences, and the vapid consumerism. Brushing this all aside for romance is not unique to film, since there is nothing new about 'Amphibian Man' since The Creature in the Black Lagoon other than a woman who is willing to follow him. However, in such a dark period of history, romantic love is a potent force, and as intoxicating as the dreams of Hollywood. * Was Guillermo Del Toro's Shape of Water influenced by the bathroom scene flooded with water in Paddington (2014) featuring Sally Hawkins?